The Mars on which the action of this novel takes place is a meticulously researched, dry and believable setting, clearly drawn by an author with a professional background in space travel research. The geopolitics of the red planet, however, are straight out of our own world: smallholders in massive debt to and reliance on the genetically modified seed-stock of RBX, the mega-corporation who own most of Mars—and most everybody on it—and have a vested interest in keeping people from freeing themselves from debt, in setting smallholders against one another, and in maintaining their absolute monopoly on biotech at any cost. Although the setting is science-fictional, the economics of the world are a variation on how colonists have worked for centuries, and almost exactly how big agritech works in much of the world today, down to their murderous crushing of any resistance or organized protest. The protagonist of this novel is one smallholder, Mahela, one of the most successful farmers in the Hellas region of Mars, who has given up everything he had on Earth to lead a small community trying to coax life from the red soil. We meet some of his crew—friends or housemates or just employees—but the only other character we get to know well is Taliyah, the geneticist who runs the seed lines and soil cultures provided by RBX, and his most trusted companion. One antagonist who gets significant screen-time (unlike the much more sinister but mysterious CEO), is the newly arrived senior executive Sun-Hee Yoo, ruthlessly efficient head of operations at RBX, and ex-girlfriend of Mahela. Several other characters affect the action in various ways—neighboring farmers, a treacherous spy, a too-efficient secretary, a disgraced ex-lover who runs black-market genetech—but these three drive the plot and take the story to its inexorable end. 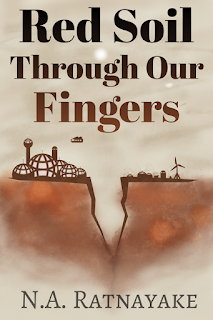 After introducing us to Mahela and Taliyah and their co-workers, and to the fascinating (and precarious) workings of life on a Martian farm, the novel takes us into the core of the plot when a mysterious disease destroys most of a season’s worth of RBX crop. It is in attempting to discover whether this is caused by their own error, sabotage by competitive neighbors, faulty company seeds, or something yet more sinister, that the farmers first attract the attention of RBX security, the all-powerful enforcers of those who effectively own the red planet. The development of intrigue and corruption is somewhat predictable from here, which is not to say that there are no shocking twists—there are—but that there is a sick inevitability to some of the outcomes of a small group of plucky pioneers taking on a solar system-wide megacorporation whose main concern is fighting off interference from the United Nations. There are a few flaws in the plot, in my opinion: at one point close to the climax of the whole novel (which I’ll keep vague in its details, to avoid spoiling the entire thing), Mahela in a sudden act of desperation remembers an obsolete and forgotten piece of primitive technology that was mentioned in a very early chapter, and creatively uses it for precisely the purpose that this reader at least had assumed it would end up being used for the moment it was mentioned—a case of Chekov’s gun being too prominent on stage, perhaps. The second major flaw is a missed opportunity for real tension: at a crucial moment, when Sun-Hee might lose everything on a single desperate throw, her opponent unexpectedly lets her win, in an action and motivation that is described in a single, matter-of-fact paragraph. Leading up to that moment more carefully, and presenting the reader with the very real danger that everything might go wrong, would have been more effective writing here, I think. I strongly suspect that an experienced editor would have pointed out and insisted on fixing both of these things. That said, these occasional flaws by no means ruin this gripping, powerful and sympathetic novel, which is informed by deep understanding of and research into both engineering and geo-politics, and populated with sometimes likeable, usually believable characters. It is a rather short novel, but while I felt that the setting, personae and intrigue would easily have supported a much longer outing, there was no need to pad things any further, and a reader doesn’t feel short-changed. One gets the sense that the series this volume inaugurates will explore a wide variety of settings and scenarios and fill out the future Ratnayake has started to sketch here, rather than simply continuing where Red Soil left off. I for one very much look forward to reading more.